Sometimes you can’t decide which image is best to feature, so you settle on an image carousel to satisfy all stake-holders. The only problem is, a constantly changing image carousel can be distracting, and might be drawing attention away from the important content on your webpage. Learn more about the dangers of image carousels on hubspot.com. When designing a website, it’s imperative to make sure that the first page your audience sees is compelling, clear, and tells them right away how to engage with your website. Hubspot has put together this great list of examples showcasing websites that do just this. Take a look and get inspired at www.hubspot.com. We’re suckers for beautiful design, even down to the smallest detail. We’re also massive music lovers and concert goers. Which is why we’re sharing this article about these adorably effective earplugs to wear to your next concert. They block out excessive volume while still letting you jam to the music. See the full list at npr.org. Interesting read from Medium.com, questioning the way that we use the term “users” when talking about UX/UI rather than “people.” It’s so important to remember that people are at the heart of everything we do, and that they are more complicated than abstract numbers, figures, or performance. Read the full story at medium.com. Did you know building and flying model airplanes is a sport? 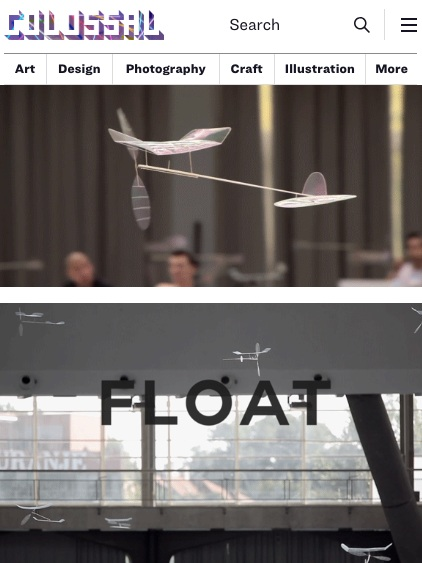 As self-proclaimed documentary junkies, we’re excited for the film “Float” which introduces the world to an indoor sport that involves building and flying self-propelled model airplanes. Niche enough for you? The planes are beautiful, and also surprisingly soothing to watch float through the air. See for yourself at thisiscollossal.com. Celebrating Women of Color in Design. In a field that can be exclusionary and competitive, it’s important to amplify diverse voices. We love this article from AIGA Eye on Design that talks to women of color in design about their experiences, and explores how we can all create learning and professional environments that fosters growth for the whole community, not just the privileged few.